Sao Mai Restaurant serves basic home cooked style Vietnamese food which is very delicious and suitable for those who are looking for. Why Sao Mai Restaurant is special ? Sao Mai Restaurant is a simple, authentic and nice place to eat. By serving local specialties, Sao Mai offers their guest a charming feel about Hoi An. Not fancy like other restaurants in town, Sao Mai still satisfies their guests by stunning food and excellent service. Sao Mai is not the prettiest of dining venues but if you are after a great meal whilst watching the passers by this place is highly recommended. How to get to Sao Mai Restaurant? Sao Mai Restaurant is located on Bach Dang Street, very near the Hoi An Market. The place is just a short walk from An Hoi Bridge. We stopped at Sao Mai looking for a quick fresh drink to alleviate our thirst on our first morning in Hoi An. We decided to go back for lunch and couldn't have taken a better decision! 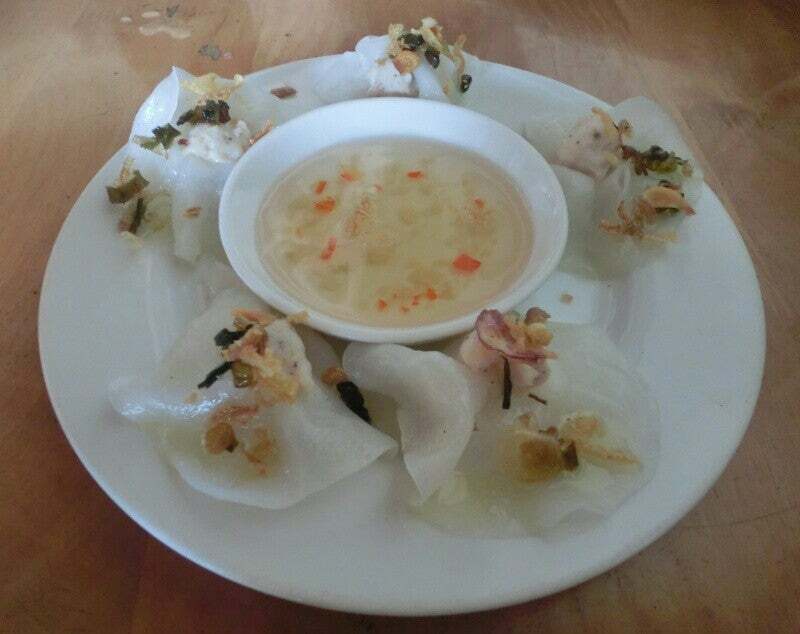 It was the culinary highlight of our Vietnam trip and we are so delighted to have been there. We had the best spring rolls - crispy and fresh, a papaya salad, and ban xeo (shrimp and pork pancake). Everything was absolutely delicious. Browsing through the pages of the menu we discovered they offered cooking classes and decided to go back the next morning. Our instructor Han was very sweet, kind and firm at the same time. It was only two hours but because we were only two we felt we were given all her attentions, and completed 4 dishes. Meeting Han was also very, very nice: she is really woman! Back home we've already tried preparing some of the dishes and it's a great travel souvenir that we will cherish for long. This was the first place we stopped at in Hoi An after lots of walking .... We were after a cold beer and something to snack on. La Rue beer was approx 15000 VND (approx $1 AUS), the first went down quickly, then we shared a bottle each time as they weren't icy cold enough to drink the one bottle yourself. (Always a way around a not so icy beer!) The food ....... Yum! Absolutely delicious and you definitely walked away with a full belly. Cao Lau Voi Thit (with pork) was recommended to us by a kiwi expat ..... It didn't disappoint and I didn't think the bowl would empty! 30,000 VND, also tried the Cao Lau Ga (with chicken) .. Also delish. The fried wonton Hoanh Thanh Chien was also a winner. We came back here atleast 3 times and sat and watched the world go by, local and worth it, looking out at the market and river.